Part 1 offered an overview and introduction to the blog series. Part 2 will discuss Kiss Coaters and Squeeze Roll Coaters. Part 3 will go through Gravure Coating, Offset Gravure Coating, and Reverse Roll Coaters. Part 4 will wrap the series up, finishing with Transfer Roll Coaters and Other Roll Coaters, and then offer a brief Conclusion. 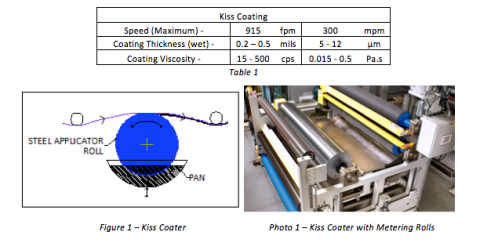 Kiss coating is a method by which coating is applied to a web that “kisses” the surface of a coating roll. The coater is typically of relatively simple design, with a single coating roll mounted such that the bottom of the roll is submersed in a pan that holds a coating (Figure 1). As the roll rotates, it picks coating out of the pan and delivers it to the web that is contacting the roll’s top surface. The web typically has minimal wrap on the rolls surface, usually between 5° and 20°. The roll is driven and may rotate in the same direction as the web, in which case the coating is split between the roll and the web, or in the opposite direction, in which case all of the coating is transferred to the web. It is typical that entry and exit idler rolls are provided to contour the web about the coating roll. It is also typical that the coating pan is vertically adjustable. There are many outside factors that affect the amount of coating that gets transferred to the web, including the amount of coating that adheres to the roll’s surface, the roll speed, the web speed, the web tension, the web wrap angle and the surface characteristics of the web. Table 1 (below) shows the typical operating speeds, coating application rates and coating viscosity for a kiss coater. Because of the number of factors that affect the coating accuracy, it is common to use a kiss coater in conjunction with other methods to meter the amount of coating applied. This can be done either prior to the coating being applied to the web, typically by metering the amount of coating on the kiss roll with a roll or knife, or after the coating has been applied to the web, by passing the coated side of the web over a mayer (wire wound) rod, in front of an air knife or between a set of metering rolls (Photo 1). The kiss coater is a relatively inexpensive coater to purchase and is easy to maintain and operate. It is also easy to change over from one coating to another/clean up, especially if the coater is designed with interchangeable pans. Though it has a limited range of coating laydown, it is very easy to change coating weights within the range. However, because of the number of conditions that can affect the laydown rate, it does not offer a high degree of repeatability. It also has a fairly limited viscosity range and maximum speed. This type of coater features two rolls that are held together at a controlled pressure. It is typical that one of the rolls features a steel surface (often chrome plated), with the other roll featuring a rubber surface. The web typically passes between the rolls in a straight line, with the coating being applied at the nip formed between the rolls. 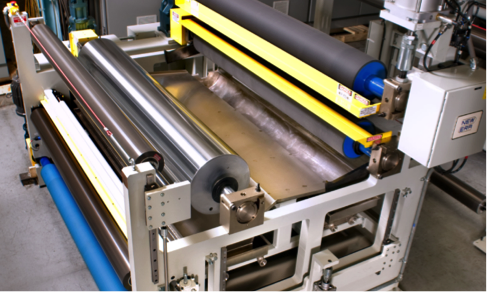 In many cases the rolls are configured vertically, with the bottom roll having the steel surface and sitting in a pan that contains the coating, much like previously described for the kiss coater (Figure 2). As the bottom roll rotates, it delivers coating to the nip with a portion of the coating being transferred to the web. The rolls may also be configured horizontally with the web traveling between them from top to bottom with the coating being held in a puddle between the rolls. The amount of coating that is transferred to the web is based on several factors including the web material, the coating viscosity and the web’s surface, and can be controlled by adjusting the speed of the steel roll (with respect to the web speed) as well as the pressure between the rolls. Table 2 (below) shows the typical operating speeds, coating application rates and coating viscosity for a two roll squeeze coater. A variation of this type of coater is one where two precision steel rolls are used to form the nip (Photo 2). In this case the amount of coating that is transferred is controlled by the gap formed between the two rolls as the web passes between them. In this case the coating thickness and viscosity can be much higher than those indicated in table 2. The squeeze coater is a relatively inexpensive coater to purchase, is rather easy to operate and maintain and offers a good speed range. It is also easy to change over from one coating to another/clean up, especially if the coater is designed with interchangeable pans. Though it has a limited range of coating laydown, it is very easy to change coating weights within the range. Though there are several factors that affect the coating application rate, it can be controlled fairly easily. It is limited in its viscosity range.